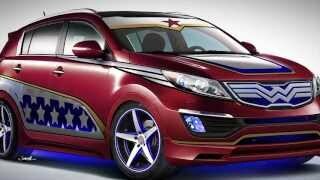 Kia as unveiled the Wonder Woman-themed version of the Sportage at the 2013 New York International Auto Show. 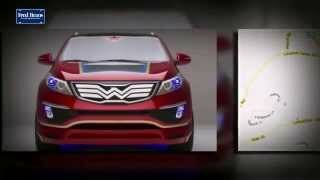 Kia teamed up with DC Entertainment and Super Street magazine to build a head-turning Kia Sportage inspired by Wonder Woman’s power, inspiration and sense of equality. The Wonder Woman-themed version is one of the iconic characters that make up the Justice League. Other iconic characters were made up by the launch of other special cars like the Green Lantern Soul, Superman Optima Hybrid, Batman Optima, Flash Forte Koup, Cyborg Forte and Aquaman Rio. It has a red and blue exterior color scheme, accented with stars, derived directly from Wonder Woman’s outfit, while the gold trim wrapped around the vehicle represents the heroine’s weapon of choice, "The Lasso of Truth." The windshield features a banner portraying Wonder Woman's tiara, and the chrome side panels on the vehicle are graphical interpretations of her invisible jet. Beneath, the 5-spoke wheel design was chosen to match the stars on the exterior of the vehicle. On the interior, red upholstery and dash pieces combined with blue LED lighting were added to continue the Sportage’s exterior color scheme into the cabin. 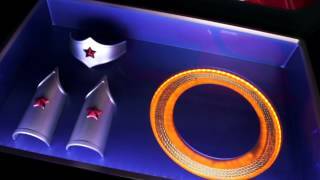 The custom seats come with an embroidered logo of Wonder Woman, while the cargo area of the vehicle is adorned with stars and an eagle and features a see-through panel, which displays Wonder Woman's tiara, bracelets and glowing Lasso of Truth. An eighth and final vehicle will be an amalgamation of all seven Super Heroes in one. 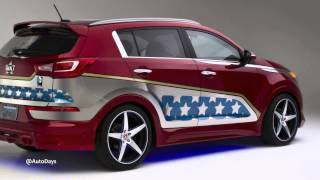 The Justice League-inspired Kia vehicles serve as a force for good in the world by raising awareness for DC Entertainment’s “We Can Be Heroes” giving campaign, a relief effort to bring help and hope to people affected by the hunger crisis in the Horn of Africa.